When will be My Unfair Lady next episode air date? Is My Unfair Lady renewed or cancelled? Where to countdown My Unfair Lady air dates? 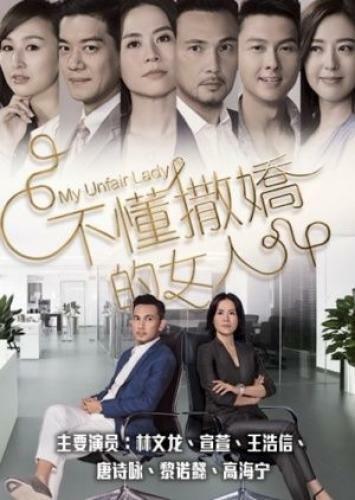 Is My Unfair Lady worth watching? Every one out of three Hong Kong women over 30 years old is unmarried. Jessica Hsuan, a mature executive who does not know how to flirt, re-encounters her ex-boyfriend, charming scholar Frankie Lam. He unexpectedly asks her: "Please control me!" Jessica's hand-picked assistant, Samantha Ko, not only goes after Jessica's career, but she is also interested in Frankie... Light-mature manager Natalie Tong has had tough luck in love. She encounters Vincent Wong, who is deeply romantic but fearful of marriage. His Taiwanese cousin uses her Taiwan-style natural flirting skills to challenge Natalie's Hong Kong style fake flirting, vowing to win over her cousin. Facing fierce attack from the most flirtatious beauties in all of China, the two Hong Kong representatives recall their past pains and vows to learn how to flirt in order to win back their lovers! My Unfair Lady next episode air date provides TVMaze for you. EpisoDate.com is your TV show guide to Countdown My Unfair Lady Episode Air Dates and to stay in touch with My Unfair Lady next episode Air Date and your others favorite TV Shows. Add the shows you like to a "Watchlist" and let the site take it from there.